Bečići is a town within the municipality of Budva. It is located south-east of Budva in a picturesque bay, surrounded by a coniferous forest and beautiful mountains and has 771 permanent residents. It has a 1,950 meter long sandy beach, which is among the most beautiful beaches in Montenegro and the southern Adriatic. In 1935 it won the Grand Prix in Paris as the most beautiful beach in Europe. Several sections of the beach are private and are only accessible to the hotel guests. 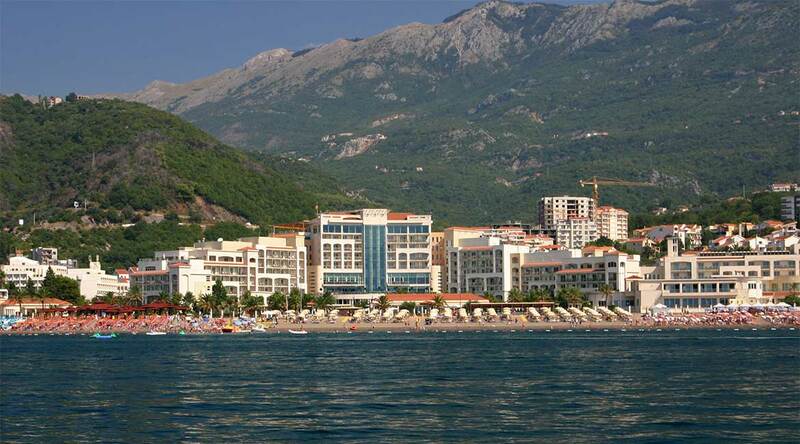 In contrast to Budva’s large number of private housing units, Bečići town mostly consists of medium and large hotels. Some of them, such as the Mediteran, Iberostar Bellevue and Queen of Montenegro have been extensively refurbished, while the most significant greenfield addition was the Hotel Splendid, a luxurious five-star resort that cost 70 million euros to build. It was the choice of The Rolling Stones and Madonna as well as Brad Pitt and Angelina Jolie during their stay in Montenegro. Since Bečići is only 2 kilometer from the Old Town of Budva, it is possible to reach Bečići from Budva by walking along the seaside promenade. During tourist season a small “auto-train” goes there until a late hour. The minibuses also stops in Bečići on their way from Budva to Petrovac and Sveti Stefan. Walking out of Bečići in the other direction, you reach the old fishing village of Rafailovići, with its pleasant cafes and restaurants. Splendid Conference & Spa Resort– The luxurious 5-star Splendid Conference & SPA Resort is located on a long sandy beach in the heart of Bečići, only 2 km from the Old Town of Budva. It features a wellness center with heated indoor pools, saunas, hot tubs and steam baths with Swarovski crystals. The elegantly furnished rooms and suites feature air conditioning, an LCD TV with satellite TV and a private bathroom with views of the Adriatic Sea and Bečići Bay. The comfortable bathroom offers a bathrobe, toiletries and a hairdryer. The hotel’s à la carte restaurant serves Montenegrin and international cuisine with freshly prepared ingredients. A selection of regional and world-famous wines is also available. Guests can use the private sand beach with sun loungers and parasols. Location – Bečići, 2.0 km from the city center of Budva (old town). Facilities : Private beach, Garden, Terrace, Bar, Breakfast in the room, Café, Snack bar, Restaurant (à la carte), Free Wi-Fi Internet Access Included, Free Parking, Outdoor Swimming Pool (seasonal), Indoor Swimming Pool, Poolside Bar, Hammam, Sun loungers or beach chairs, Sun umbrellas, Sauna, Spa & Wellness Center, Facilities for disabled guests, Designated smoking area, Solarium (surcharge), Meeting / Banquet Facilities, Business Center (surcharge), Shoe Shine, Private Check-in / -out, Concierge Service, ATM / Cash Machine on site, Luggage Storage, Tour Desk, 24-Hour Front Desk, Babysitting / Child Services, Car Hire, Room Service.